What is the form DS 3053 Statement of Consent, and when do you use this application form? The DS-3053: Statement of Consent or Special Circumstance for Minor Passport is necessary when one parent is applying for a passport for a child without the other parent or has sole custody of the minor. To use this application, you will have to download the DS-3053, in PDF form. Fill it out using black ink. If a parent or guardian has sole custody of the child, then this form is not necessary, and you would be able to apply for the child’s passport without the other parent using the DS-11 Application form for New Passport. The State Department requires that parents or guardians fill out the DS-3053 Statement of Consent Application Form. You will need to get a witness and have the document notarized. The absent parent/guardian must complete the DS-3053 form and signed it in front of a notary public. Include a photocopy of both sides of an identification card along with the form. Submit the form within three months of notarizing it. If there is no address for one parent or is in prison, then submit Form DS-5525 “Statement of Exigent/Special Family Circumstances.” When submitting this form provide as much detail as possible and any supporting documents. Documents like a custody order, incarceration order, or a restraining order form. In the absence of both parents/guardians, the person applying must have a written notarized document form both parties granting authorization. Include a photocopy of both parents’/guardians’ identification card. In the case when the statement is from one parent/guardian, proof of sole custody must be provided. Processing time for passports is approximately four to six weeks. Expedited processing options are available for additional fees. REMINDER: Complete all documents in black ink and sign in front of the acceptance agent. You are an applying parent or guardian, and the written consent of a non-applying parent or guardian. How to use the DS-3053 Parental Consent Passport Form? Submit a photocopy of the front and back of the same Identification shown at the Notary Public with the DS-3053 form. How to use the DS-3053 Statement of Special Circumstance? Please note: This application form should be filled out using black ink. A Certified Public Notary should witness the signature. Step 1: Complete Items 1 through 3 which is the minor’s information such as name, date of birth and relationship. Step 2: Complete Item 4a Statement of Consent if you are a non-applying parent or guardian submit the minor’s application. Step 3: Notary Public should fill out this section which is the Notary Public Information. DS-3053 must be submitted along with form DS-11 at an approved agency or acceptance facility within three months of the date it was notarized. Notarize any future Statement of Consent from the non-applying parent. Question: Can I use a copy of the form DS-3053? My daughter’s dad lived in Mexico and filled out the form at the embassy. Can he email it to me and I print it and take it to post office? Will they accept a copy of the notarized form? Answer: Yes you would need a clean copy of the original notarized DS-3053 Application form. Question: My daughter’s passport expired last year. She is now 14 years old. When I first got her passport, her mother came with us for the DS-3053 consent. Can I do a regular DS-82 renewal or do I need another DS-3053? I am in NC, and her mother is in NV. Answer: You will need her mother to come along to sign the DS-11 Application Form to renew the child passport. Question: I am taking my 14-year-old niece without her mother on vacation. I am filling out the form DS-11 to get her passport. Her father is filling are out the DS-3053 Application form. I am going to the Regional Passport Agency, and I am taking the following items birth certificate and two 2×2 passport pics. What an else do we need to bring? Answer: If you are going to a passport agency you might need to bring along a letter for emergency travel plans. Additionally, you will need to bring the following information expired passport, birth certificate, passport photo and DS-3053 refer to our child passport section for more details. Question: Is it possible if the father sends me a notarized clear copy by email (DS-3053)or has original? Answer: Yes it is ok to have a clean copy of the notarized copy of the DS-3053. Question: My child’s father is in Italy, can he use an Italy notary(in English) for the Ds-3053 consent form? Answer: Yes, as long as it is certified notary it should work. But to be sure it is best that you go to the U.S. embassy in Italy and get the application notaries. 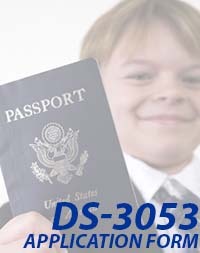 Question: Do you need the DS-3053 when renewing passport for a child who is 16 years of age? Answer: If the child is 16 years old, you will no longer need the ds-3053. The child would be able to apply for a ten years adult passport. Question: My husband is in Mexico, and I want to travel with my newborn but I need the DS-3053 if he faxes it to me would that work? Answer: If your child is a U.S. citizen you will need the ds-3053 to be clear it would be better if he Fedexes the application to you. Question: I am applying a for a renewal passport for my daughter. We live in Mexico. My husband will not be coming with us to the appointment, so I need to take the notarized consent form DS-3053. Can I notarize the form in Chiapas where I live and then take it with me to the appointment or should I do it at the consulate? Answer: You will need to notarized it by a certified notary, but we recommend you do it at the consulate to avoid denial. Question: Can I print Form DS-3053 on both sides for notarization or should I do it on two separate sheets of paper? Answer: Print the application on two separate sheets. Question: My daughter’s father does not live in the US, and I haven’t heard from him in years. My daughter is six years old, and we’re planning to travel next month. How do I renew her passport without the DS-3053 form? I don’t know where he is. Answer: You will need to get to get sole physical custody of the child to apply without the DS-3053 form. Question: I have sole physical custody but 50% legal. Do I need the other parent to fill out the DS-3053 or just proof of the guardianship? Answer: You will need to apply with the DS-3053 Application form as you have 50% legal custody. Question: About the DS-3053 form, if one of the child’s guardian cannot be present because they are currently overseas will a notary (police, certified notary) from the country suffice as for the form to be valid. Or does the notary have to be here in the USA? Should the parent who is present with the child use a local notary and can that notary somehow contact the parent that is currently overseas. In short, I am asking is a notary from outside of the USA recognized and valid on the DS-3053 form. Answer: You could use a notary from outside the United States, but it would have to be a certified notary in English. We recommend you go to the U.S. consulate and get the application notaries. Question: My three sons & I are planning on going to Greece at the end of July. They all had minor passports issued in 2001. My two oldest are 22 & 20 yrs old. My youngest is 16yrs old. We got divorced, and he lives 8hrs away. He does not have a license anymore. Will I still need to get him to sign the DS-3053 for my 16yr old or since he will be 17yrs old in Oct. and he lives w/ me 365/yr? I don’t receive regular child support. Answer: Because your son is 16 years old he would be able to apply for a new adult passport and would not need the ds-3053 application form. Question: I am the Legal Guardian of my granddaughter. Is it possible for me to have her passport processed with only me present and notarized copies of DS-3053 from both parents; or must one parent attend along with a DS-3053 from the second parent? Answer: You will be able to apply using the DS-11 Application form without the DS-3053 because you are the legal parent of the child. Question: If I am renewing a child’s passport and I fill out the DS-3053 do I still need notarized “written” consent from the other parent. Also, does the child need to be present when I submit the renewal application? Answer: You would not be able to renew a child passport. You would have to apply for a new child passport which expires every five years. Yes, the child would need to be present to sign the DS-11 form. Question: My husband is overseas, and I was wondering if it was possible for him to sign and notarize form DS-3053 and fax it to me or send me a copy of my email. I have already got my appointment and then found out that the photocopy has to be not more three months old and I don’t have to receive a new one by mail. Would a copy of a new notarized form be enough? Answer: It is better to get a scanned copy of the DS-3053 as the application needs to be a clean copy. Question: Is a DS-3053 necessary to obtain a passport card for minors? Also is a passport card essential for infants? Answer: Yes! You still need the statement of consent if you are applying for a passport card. Question: My daughter, Jessica (then 15 yrs old) and I got new passports early last summer. We moved in late last August and unfortunately, Jessica’s passport is missing since! Thinking it’s somewhere in the new house but we have not located it yet, and we have a cruise booked for August 19th. I was wondering what my best options are. Last year I needed a notarized DS-3053 from her father. Do I still need that since she is currently 16, almost 17? I heard there are same day facilities in Philadelphia & NY, is that an option for us? Please advise! Answer: You would need to use the DS-64 Application for Lost Passport and DS-11 for New Passport as the child would now be able to apply for an adult passport. I am having another child in France and I have to leave for work prior to getting the CBRA, can her French mother go to the embassy and file all the paperwork with copies of everything that is needed? Or do I as the American parent have to be present? This is our second child who was born in France (not sure if this changes anthing). I’m the non-applying parent, what should I do after filling out the DS-3053? Can email to her the DS-3053 copies or do I need to go to the post office? Me and my daughters father have never been married. He signed her birth certificate, but never filled out any requests for paternity. I have 100% physical custody but am not sure as to whether I have full legal custody as well. Would I still need to find him and have him fill out a DS-3053? Or what serves as evidence of sole authority to apply for my daughter’s passport? hello yes each child will need one. I have four boys under 10 years all same dad and i have to get the ds 3053 form do i need one for each child? U.S. Passport Help Guide what can be done for a child of the age of 13 that needs to renew her passport but one of their parent has departed? The family doesnt really reach out and speak to the other parent.The other parent has tried all she could to get in contact with the departed family member,but they are not really trying to help with the renewal of the passport.Any way around this issue? what can be done if one of the child’s parents have departed.You have no contact and the family of the departed parent doesn’t really want to speak to you? how can the child renew their passport with this issue? U.S. Passport Help Guide do you have to bring anything along to prove you have sole custody? on the tempoary custody paper work does it grant you permission to travel and obtain passports for the children? do you have sole custody?